Award-winning game designer and narrative designer Chris Bateman has been working on games since the 16-bit consoles and has over fifty published game credits, most recently acclaimed PlayStation VR game The Persistence and the much-anticipated strategy sequel Tropico 6. 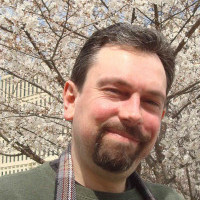 The founder of Develop Award Nominee International Hobo Ltd, the first consultancy to combine narrative and game design skills under one roof, Chris won the IGDA's MVP Award for his work founding and running the organisation's highly-successful Game Writers Special Interest Group. Narrative Design is the art and craft of combining the practices of game designers with the practices of writers, and it is a skill unique to the games industry. This talk works as a ‘survival guide’ to the challenges of designing engaging narrative videogames by breaking down the different structural approaches relevant to game stories and identifying the ‘fault lines’ between player agency and conventional narrative theory. Although the practices of narrative design are as old as the industry, the first ‘narrative designer’ job role was created in 2002 by International Hobo, which set up shop in 1999 with the goal of combining game design and writing talent under one roof. Through the IGDA Game Writing Special Interest Group, the terms ‘narrative design’ and ‘narrative designer’ spread throughout the games industry. This talk shares Chris experience of the narrative design problems of his more than fifty videogame projects, and offers new methods for analysing narrative design and practical solutions to common problems. Core to this ‘survival guide’ is an understanding of game structures, the different ways that the inherently repetitive elements of game design (the ‘core game loop’, and more besides) inevitably create stories from the player’s perspective, whether or not the game expressly tries to implement narrative elements. Don't die in the game story wilderness – let The Narrative Design Survival Guide protect you from the risks of bringing stories right into the heart of the player experience.